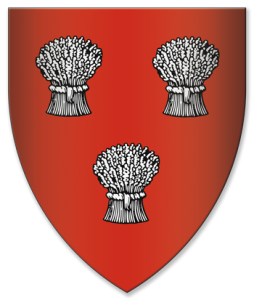 John was the son of John ‘the Red’ Comyn, Lord of Badenoch and Lord of Lochaber (died 10 February 1306). The Comyns were among the dominant feudal families of Scotland, with strong links to the English crown and to the Baliol family which had a claim to the Scottish crown, and were therefore rivals of the Bruces. John ‘the Red’ Comyn had been murdered by Robert the Bruce, the future Robert I of Scotland, before the altar at Dumfries’s Greyfriars Church, an act which created major problems for Bruce, especially in his dealings with the Papacy. The younger John, who had succeeded to the feudal barony of the Lordship of Badenoch as a result of his father’s murder, was then sent by Edward I to England, where he was placed in the care of Sir John Weston, guardian of the royal children. He grew to manhood in England, and did not return to Scotland until 1314, when he was killed at the Battle of Bannockburn, fighting on the English side. The lands of the Comyns of Badenoch were forfeited after Bannockburn. They were distributed to allies of the victorious Bruce, the Hays, Keiths and Douglasses.